The Godolphin-owned AL HILALEE became the 94th winner of a Tattersalls October £25,000 Book 1 Bonus when taking out the Weatherbys British EBF Maiden Stakes on Newmarket's July Course this afternoon. 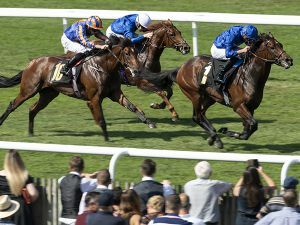 Charlie Appleby trained the smart son of DUBAWI who earned a total of £40,263 for his owner, made up of £7,763 in prize money, £7,500 from the Plus 10 Bonus and a Book 1 Bonus worth £25,000. This year Book 1 of the Tattersalls October Yearling Sale takes place October 9 - 11.